The Colorado Rockies head to Dodger Stadium on Saturday, September 9, 2017 to take on the Los Angeles Dodgers. The expected starting pitchers are Chad Bettis for the Rockies and Alex Wood for the Dodgers. The odds for this matchup have Colorado at +214 and Los Angeles at -232. The Rockies have a 57-77-6 over/under mark and a 70-70-0 run line record. The Dodgers are 69-71-0 against the run line and have a 59-71-10 over/under record. The Rockies have a 75-65 overall record this season. Starting pitcher Chad Bettis has a 0-2 record with an earned run average of 4.91 and a WHIP of 1.26. He has 18 strikeouts over his 29.1 innings pitched and he's given up 32 hits. He allows 9.8 hits per 9 innings and he has a FIP of 5.62. The bullpen has an earned run average of 4.52 and they have given up 460 base hits on the year. Teams are hitting .252 against the bullpen and they've struck out 463 hitters and walked 180 batters. As a team, Colorado allows 9.1 hits per nine innings while striking out 7.9 batters per nine innings. They are 22nd in the league in team earned run average at 4.65. The Rockies pitchers collectively have given up 1,266 base hits and 643 earned runs. They have allowed 173 home runs this season, ranking them 17th in the league. Colorado as a pitching staff has walked 468 batters and struck out 1,097. They have walked 3.4 men per 9 innings while striking out 7.9 per 9. They have a team WHIP of 1.39 and their FIP as a unit is 4.41. As a team Colorado is hitting .273, good for 2nd in the league. The Rockies hold a .441 team slugging percentage and an on-base percentage of .337, which is good for 4th in baseball. They rank 3rd in MLB with 9.3 hits per game. Nolan Arenado is hitting .305 with an on-base percentage of .365. He has 163 hits this season in 534 at bats with 116 runs batted in. He has a slugging percentage of .581 and an OPS+ of 128. 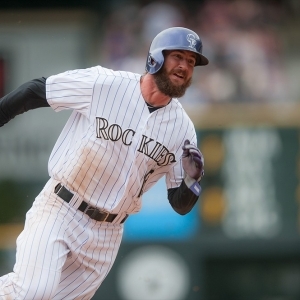 Charlie Blackmon is hitting .340 this year and he has an on-base percentage of .406. He has totaled 192 hits and he has driven in 87 men in 564 at bats. His OPS+ is 148 while his slugging percentage is at .622. The Rockies have 1,307 hits, including 252 doubles and 165 home runs. Colorado has walked 442 times so far this season and they have struck out 1,229 times as a unit. They have left 941 men on base and have a team OPS of .778. They score 5.1 runs per contest and have scored a total of 714 runs this year. Los Angeles has a 92-48 overall mark this year. With an earned run average of 2.57, Alex Wood has a 14-2 record and a 1.04 WHIP. He has 134 strikeouts over the 129.1 innings he's pitched. He's also given up 101 hits. He allows 7 hits per nine innings and his FIP stands at 3.13. The bullpen has an earned run average of 3.22 and they have given up 382 base hits on the year. Teams are hitting .214 against the Dodgers bullpen. Their relievers have struck out 538 batters and walked 150 opposing hitters. As a team, Los Angeles allows 7.5 hits per nine innings while striking out 9.6 batters per nine innings. They are 1st in the league in team earned run average at 3.33. The Dodgers pitchers as a team have surrendered 1,050 base knocks and 464 earned runs this season. They have given up 158 home runs this year, which ranks 26th in Major League Baseball. Los Angeles as a staff has walked 385 hitters and struck out 1,341 batters. They give up a walk 2.8 times per 9 innings while they strike out 9.6 per 9. Their team WHIP is 1.15 while their FIP as a staff is 3.63. As a team, they are batting .251, good for 19th in the league. The Dodgers hold a .438 team slugging percentage and an on-base percentage of .336, which is good for 6th in baseball. They rank 22nd in MLB with 8.4 hits per contest. Cody Bellinger comes into this matchup batting .272 with an OBP of .349. He has 110 hits this year along with 83 RBI in 405 AB's. He maintains a slugging percentage of .605 with an OPS+ of 145. Justin Turner is hitting .327 this season and he has an OBP of .418. He has collected 130 hits in 397 at bats while driving in 62 runs. He has an OPS+ of 150 and a slugging percentage of .534. The Dodgers as a unit have 1,177 base hits, including 266 doubles and 191 homers. Los Angeles has walked 556 times this year and they have struck out on 1,202 occasions. They have had 980 men left on base and have an OPS of .774. They have scored 4.79 runs per game and totaled 671 runs this season.